For Australians tempted by Papua New Guinea’s adventure and intrigue but not willing to forego their creature comforts, the growing cruise industry offers a combination of luxury and adventure for an unforgettable experience. According to the Australian Cruise Industry, cruising is becoming increasingly popular with Australian travellers with a 27 per cent increase in numbers in 2010 compared to 2009, and the South Pacific has the largest share of this market. While PNG remains one of the last, largely un-touched tourist destinations of the world, the growing cruising industry is cashing in on the Australian fascination with our closest neighbour. Papua New Guinea Tourism Promotion Authority’s (PNG TPA) Australian Representative, Michael Woods said the comfort of cruise ships is a massive draw card for travellers who are looking for a relaxing holiday but who also want that adventure hit. “Cruising allows the more discerning travellers who still want a taste of adventure to be able to experience the incredible culture, snorkelling, landscapes and birdlife of PNG combined with the onboard comfort of a cruising vessel,” Mr Woods said. Cruising enthusiasts and even first time cruisers should take note of the specialist cruise companies each offering a different kind of experience to their passengers. Orion Expeditions Cruises’ luxurious Orion and Orion II will set sail in March and October 2012 to explore the islands of Papua New Guinea with their specialist expedition team. 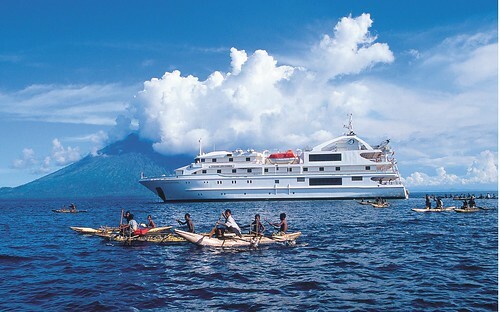 Orion Expeditions is offering an early booking incentive of 25% off all PNG voyages for those who book before 30 November 2011 for the 2012 season. Normally $8,995 per person for twin share in an ocean view stateroom, the reduced rate on offer is $6,745. To book email info@orionexpeditions.com or call 1300 361 012. Coral Princess Cruises boast a unique vessel, built specifically for this part of the world, allowing passengers to explore parts of PNG that are inaccessible to many other cruise ships. The Oceanic Discoverer is designed to be able to travel in shallow water meaning a trip up the mighty Sepik River is made possible. While the incredibly scenic Sepik River is popular for canoeing and fishing, Coral Princess Cruises’ passengers are also able to visit remote villages along the Sepik that are renowned for their artists and woodcarvers. Prices start at $8,690 per person, twin share for 10 nights Alotau to Rabaul or vice versa or $9,090 per person, twin share 12 Nights – Cairns to Rabaul or vice versa. For further information and reservations contact Coral Princess Cruises on 1800 079 545 or visit www.coralprincess.com.au. For travellers to PNG who really crave that luxury experience but not the price tag, North Star Cruises have announced half price upgrades for their PNG Adventures in Paradise cruises departing in 2011. The offer is open to both new and existing bookings and provides passengers with the chance to experience the next level of cabin luxury at a fraction of the cost. The offer is only available for a limited time. Contact North Star Cruises for more details or to book www.northstarcruises.com.au or call 08 91921 829. 2012 marks the 70th anniversary of Australia’s involvement in the war at Kokoda and to commemorate the occasion, Aurora Expeditions have launched a special voyage to run in April next year that will visit historical sites from Alotau to Rabaul, ending with a dawn ANZAC Day service in Rabaul. An on-board historian will share knowledge and stories of war history. This 13-day expedition starts from $5,690 per person quad-share, including all meals on board, shore excursions and lectures. Sea kayaking surcharge is $995 and scuba diving stops will be organised on board. Aurora Expeditions’ Experts on +612 9252 1033 or 1800 637 688 (freecall within Australia) or visit www.auroraexpeditions.com.au.